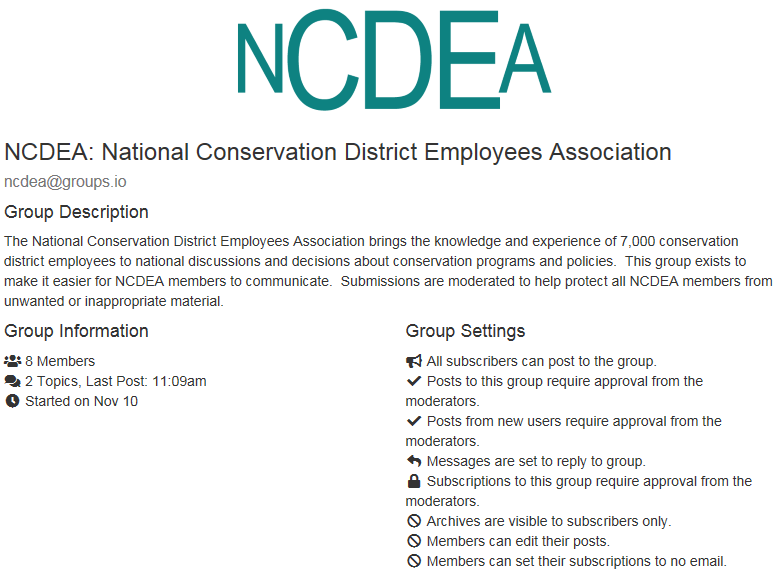 Fostering better communications within our large family of conservation district employees is one of the core functions of the National Conservation District Employees Association. The knowledge and experience carried by conservation district professionals is astounding but it is of little use to others if you don’t share it. The group is restricted to conservation district employees. If you are employed by a conservation district, please join. This is a free service – there is no cost to you. The NCDEA Network is very new so there are as yet few participants. We’ll figure out the “rules of the road” as more people join in. For now, please treat each others with respect, just as you would like to be treated. Individual Messages will send each email individually, as soon as it’s posted. Full Featured Digest will group the days messages into batches of 12 and send each batch when the twelfth is posted. Any that remain at the end of the day will be sent as the final (or only) digest of the day. The digests include the full text of each message, omitting any quotes of prior messages. Full Featured Digests include at the top a list of the enclosed topics, clickable as links to take you to that topic. Plain Digest works the same way, but is sent as a text/plain email message, with no clickable links. Daily Summary sends a once-daily list of topics posted that day. Unlike the digests the summary does not include the text of any of the messages, only the list of topics. Special Notices Only sends only those messages which a moderator has designated as a Special Notice. No Email sends no posted messages to you by email. You may still receive individual notifications from the group and/or from Groups.io.